But as the civil unrest in his country grew — and the government caught wind that he was aiding wounded Syrians —he knew that he’d be in danger if he returned. He left behind his parents, apartments, childhood mementos, pictures, winter wardrobe, nearly everything. The medical worker and the organizations he is working with are keeping his name secret to keep his family safe. Leaving his country led him to meeting the very people he never thought would be willing to help him and his fellow Syrians: the Israeli and Jewish communities. And while Israel and Syria have been foes for decades, a group of Jewish leaders and Israelis are focusing on the humanitarian side of the war — the more than six million people that have been displaced because of the political unrest. According to the United Nations High Commission for Refugees, about two million of the refugees, mostly woman and children, have gone to Jordan, Lebanon, Turkey and Iraq. The money is not coming in fast enough to support the influx. Georgette Bennett, founder and president of the Tanenbaum Center for Interreligious Understanding in New York, said when she heard about the crisis she felt compelled to help. Within weeks, Bennett formed the Jewish Coalition for Syrian Refugees in Jordan after reaching out to Alan Gill, the CEO of the American Jewish Joint Distribution Committee. Bennett said they chose to focus on Jordan because the small country was being overwhelmed by refugees. 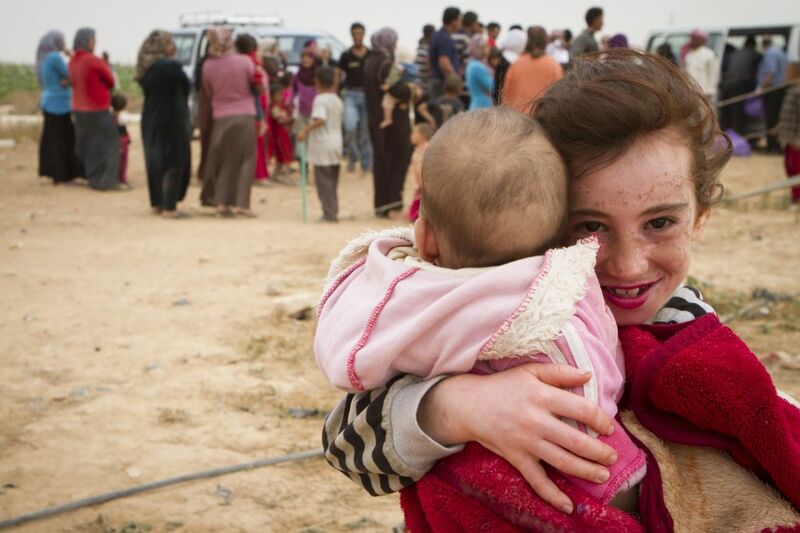 As of January 2014, there were 600,000 registered Syrian refugees in Jordan, and at least 300,000 more unregistered Syria, according to the UNHCR. “It seemed so obvious that we had to do something,” he said. By August 2013, they formed the Multi-Faith Alliance for Syrian Refugees in Jordan, made up of 31 organizations, and raised about $500,000 to aid the refugees. Bennett said raising money has been a challenge, citing donor fatigue and lack of awareness. Meanwhile, there has also been an effort in Israel to aid the refugees going to different countries. Nir Boms, an Israeli policy analyst who has been deeply involved in aiding Syrian refugees, who was also part of the panel, said their first efforts began around March 2012. Through efforts including Operation Human Warmth, the Israelis have sent 1,350 tons of goods including food and clothing. Boms said he recently visited a refugee camp in Jordan and was shocked by the endless rows of tents. For the Syrian who was on the panel, meeting Boms for the first time at a meeting in the Middle East was eye-opening. He realized that the Israelis were willing to help. And he knew his country — and all the refugees — needed help. The panelist, who was born and raised in Syria, said it was hard to see the infighting. In March 2011, protests to oust the Ba’ath government began, leading to an ongoing war in the country. The situation got progressively worse and as someone in the medical profession, he knew he had to help the wounded. But the government, he said, was not happy with his humanitarian efforts. In 2011, he sent his wife and daughters to live in the United States. He later joined them, but still travels to different Middle Eastern countries to help refugees. After meeting Boms, the Syrian began working with Jews to help the refugees and spread awareness of the crisis that “doesn’t seem to have an end,” he said. For Bennett, the panel was only the beginning of getting the word out not. “This is a message of hope in terms of what happens when you get beyond politics,” Bennett said.